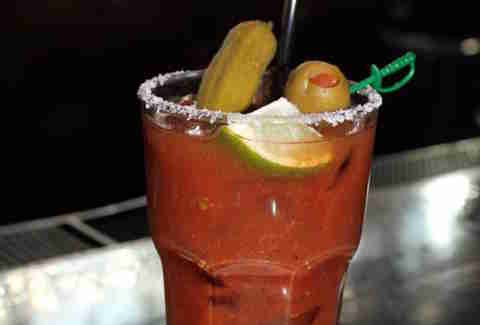 Turns out there may be a wrong way to drink a Bloody Mary: avoid tasteless V8-like mixes and half-hearted vodka pours at these nine Memphis establishments that go the extra mile for the ultimate hangover-killing cocktail. Maybe we're purists, but you're not going to see a whole lot of roasted chickens, pizzas, or piles of grilled cheese sandwiches sticking out of our glasses (unless it's the Burger Fest Bloody Mary competition, of course). So, get straight to the point with classic garnishes, homemade mixes, and infused vodkas. The Majestic's award-winning Bloody Mary is completely house-made and crafted in small batches weekly with a secret combination of spices. Need proof it's worth a try? 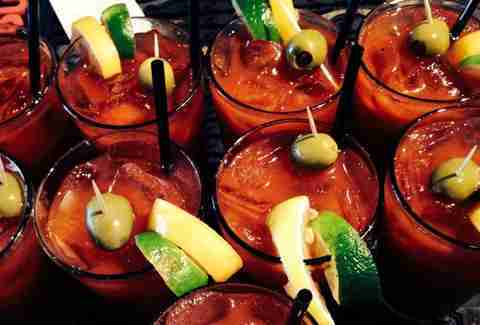 The popular downtown brunch spot goes through about 200 Bloody Marys each Saturday and Sunday. One of Memphis' favorite places for brunch, Owen Brennan's naturally has an excellent Bloody Mary to complement its overflowing Cajun buffet. 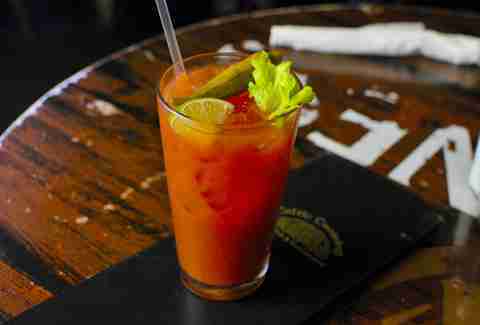 In fact, Brennan's Cajun Mary -- made with Absolut vodka, Zing Zang, a slew of hot sauces and spices, and bacon and cocktail shrimp garnishes -- won 1st place in Tennessee for Thrillist's 2013 "Best Bloody Mary" competition. 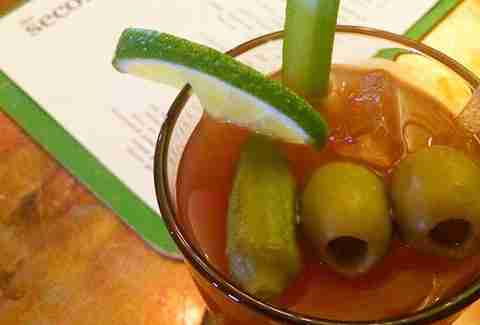 The newly renovated Irish pub and neighborhood institution goes with the tried-and-true Zing Zang mix as the foundation of its weekend brunch's Bloody Mary. But then the folks behind the bar take it up a notch with a special mix of olive and citrus juices before adding a celery stalk, more olives, and pickled okra. Sure, you could go for the basic, dirt-cheap Bloody Mary at Bayou's uber-popular midtown brunch, but you'd be missing out. 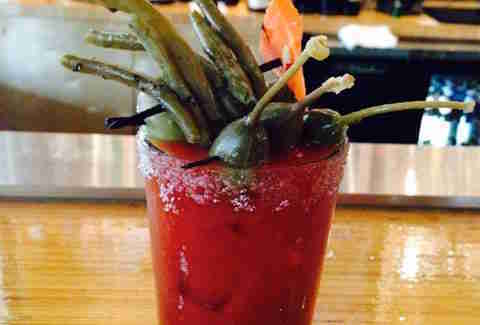 Instead order the upgrade: the award-winning Bayou Absolut Peppar Bloody Mary, made with pepper-infused vodka and garnished with a dill pickle spear, a banana pepper, an olive, and a lime. 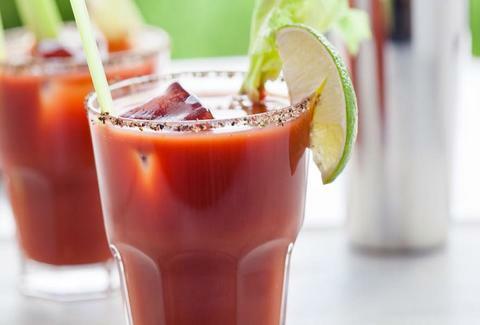 The Bad Boy Bloody Mary gets its name for two reasons: first, the oversized wine glass it comes in is deceptively large and filled to the brim; second, the brunch cocktail is as spicy as it is potent. You'll be feeling good after one Bad Boy and ready for your brunch crepe special. It's garnished with a green olive, a lime, and pickled okra. Alchemy's Bloody Mary bar lets you gussy up your Bloody Mary with choices of house-made regular or vegan mix, spice or no spice, and optional Clamato juice. Then, add anything from celery to jalapeño to the pickled veggies of the day, and finish it off with a rim of kosher, celery, or pink Himalayan salt. Go for broke with a garnish of blue cheese-stuffed olives. 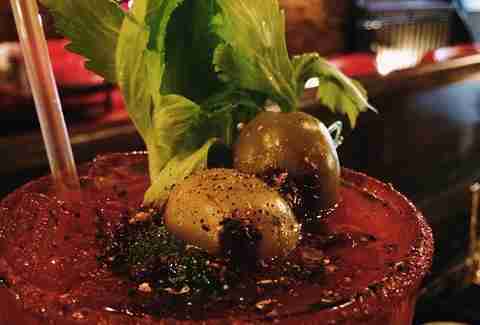 Bardog's Bloody Mary mix is made by Memphis-area hot sauce company Crazy Good; it whips up a special version of its "Crazy Mary" mixer for Bardog with green chile dust, horseradish, and Worcestershire. Then the bartenders add a little extra pickle juice, a celery salt rim, and a collection of garnishes for the perfectly savory and rich hair-of-the-dog breakfast drink. Get your weekend dose of lycopene at popular South Main gastropub South of Beale. The mix is a top-secret recipe from behind the bar, and they're garnished with lemon and lime wedges. 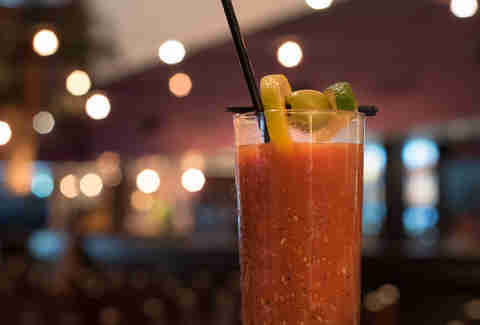 At just four bucks during brunch, you'll be able to enjoy a couple of these Bloodies without breaking the bank. Most folks head to the Second Line for things like fried shrimp, pimento cheese fries, and po-boys, but the bar at this NOLA-inspired establishment is just as on point with its Bloodies. 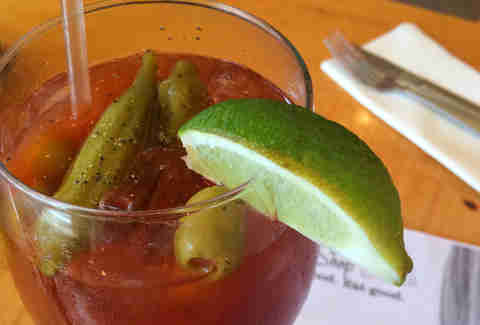 There's just the right amount of spice and a healthy vodka pour, plus a garnish of olives, a lime wedge, celery, and pickled okra.